Many healthcare providers prefer (or need) to document their patient encounters outside of the office/clinic environment. Whether they’re catching up on patient charts or working remotely, clinicians regularly ask us about installing Dragon on their laptops, dictating with their smartphones, routing files to transcriptionists, and more. To address those needs, we decided to produce a guide to using Dragon Medical outside of the office. In this article, we’ll cover the most common options healthcare providers have when it comes to integrating Dragon speech-to-text into their remote, after-hours, and locum tenens documentation scenarios. 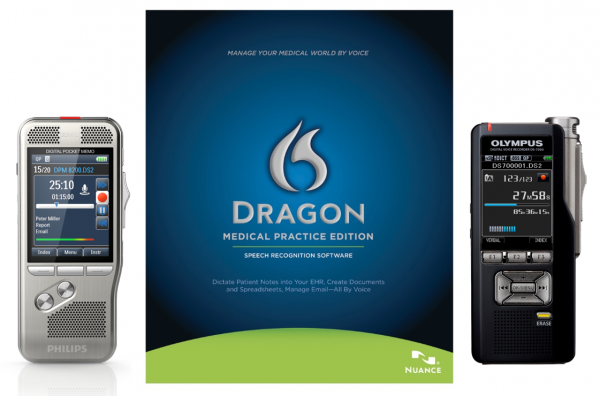 The version and edition of Dragon that we’ll be referring to in this article is Dragon Medical Practice Edition 2. When working with this application, you will always need a computer—whether that’s a laptop or desktop—to install it on. There is no current Dragon Medical Practice Edition 2 application available for the smartphone. Rather, some of the tips we will be providing refer to third party applications and/or hardware. Dragon Medical Practice Edition 2 is a Windows-only program. Please make sure that any computer you install the application on meets the minimum requirements specified in the Dragon Medical Practice Edition 2 Administrator Guide. Many providers want to know if they can install Dragon Medical on both a work computer and a home laptop. Yes, you can install Dragon Medical Practice Edition on up to four computers. If you get beyond four computers, uninstall Dragon from one to free up another install, or consult with your Dragon reseller. They may be able to get you more activations from Nuance directly. Aside from portability, there’s not a great deal of physical difference between using Dragon dictation on a laptop and a desktop. You will have fewer USB ports, which may mean you need to unplug something to plug in your speech recognition microphone. That’s about it. Where the real difference comes in is in performance, access, and connectivity. You will want to check your laptop’s system specs, to see if they differ from your clinic workstation. If your laptop has less computing power, you’ll probably notice it when using Dragon Medical. If you want to improve this performance, consult with your IT department. If you dictate directly into an EHR at the office, there’s a decent possibility that you won’t be able to at home. Because of the various layers involved in accessing EHRs, it’s likely that you will need to use the Dictation Box in Hidden mode to make your notes. This is definitely a workable solution, and we regularly train clinicians on how to do this successfully. That being said, let’s look at some scenarios where you should be able to dictate directly into your EHR with Dragon. If your electronic health record software is installed locally on your laptop, along with Dragon Medical speech recognition, you should be able to dictate directly into your patient charts. Caveat: If your EHR does not support Dragon Medical Practice Edition 2 natively, you will still need to utilize the Dictation Box. If your EHR is published to the World Wide Web, and can be accessed publicly, you should be able to use Dragon Medical voice recognition directly in the application. You will need to ensure that the web browser has the Dragon plug-in installed/enabled for full compatibility. Again, the same caveat applies: EHRs that don’t natively support Dragon Medical require the Dictation Box. Maybe you aren’t even making patient notes in an EMR. You might have a Microsoft Word template that you dictate into, or some other word processing software. Check the Dragon Medical Practice Edition 2 Administrator Guide for supported applications. Your EHR may be installed on your work computer, hosted on an application server, or delivered in some other method than locally. It’s very possible that you will need to remote into your main workstation, VPN into your network, or connect to your EHR through multiple virtualization layers. In each of these cases, when using Dragon speech recognition on your laptop, you will need the Dictation Box. You may also have to perform additional setup/configuration. Please note, there is no guarantee that Dragon Medical Practice Edition will work in every deployment. Refer to the administrator’s guide linked above for more details. So long as the tablet meets Dragon Medical Practice Edition 2 specifications and runs a supported version of the Windows operating system, you should be able to install and use voice recognition. This disqualifies iPads and Android tablets. Let one of our technicians help you design and configure your Dragon dictation setup, so that you can make patient notes wherever you need to. If you don’t have a laptop or tablet that you can use with Dragon, or if you don’t want to carry your laptop around, you still have options. A digital voice recorder will enable you to dictate patient notes while you’re away from your computer. After the dictation is finished, you can send it through Dragon directly—or through background voice recognition using 3rd party software. You’ll also need to consider how you get those dictations from the recorder to a computer with Dragon installed, whether that’s your clinic workstation or your home laptop. Let’s look at some of the possible scenarios. One of the simplest ways to get your dictations onto a computer is to plug it in (or dock it). Some of these recorders come with software that will download the dictations from your device to the computer automatically. If that’s not an option, you can always manually transfer the recordings. If the computer you’ve uploaded your files to is not your Dragon workstation, you can email them as attachments, or configure your 3rd party software to email dictations automatically. While it’s unlikely that you will have access to your clinic’s network file server from home, it’s certainly a possibility. After uploading your files, you can manually move them to the appropriate folder, or configure your 3rd party software to store dictations on the network. Once the dictations are on the right computer, Dragon Medical Practice Edition 2 has a transcription function that can be accessed right on the DragonBar (Tools > Transcribe Recording). Alternatively, you can use the AutoTranscribe Folder Agent, which is located in the same menu area. Some digital recorders come with their own software, like Philips SpeechExec Pro Dictate or the Olympus Dictation Module. These applications can be configured to integrate with Dragon Medical and run your dictations through speech recognition automatically. Philips and Olympus both provide dictation apps for iOS and Android. These are subscription services that allow you to dictate and email files to your Dragon workstation. From there, the process of speech recognition is the same for files downloaded from a digital voice recorder. Nuance has a speech-to-text app, Dragon Anywhere, that will actually transcribe your voice right on the phone. You can then email that document or share it over Evernote, Dropbox, etc. Like the Philips and Olympus apps, this is also a subscription service. *Dragon Anywhere is not currently targeted for healthcare uses, as it does not have medical terminology in its vocabulary. Be aware that for many providers, this may not be an adequate solution. Schedule an appointment with one of our technicians today! Here at Certified eSupport, we’d love to help you set up a dictation workflow for making patient notes outside of the office. We can install and configure Dragon for you, set up your Philips or Olympus software, and even train you on how to put it all together. Click the button below for information about our technical services. Can Dragon® Dictation Yield Ski Vacations? What Is Dragon Medical One Cloud Speech Recognition? Should I Upgrade to Dragon Medical Practice Edition 4?